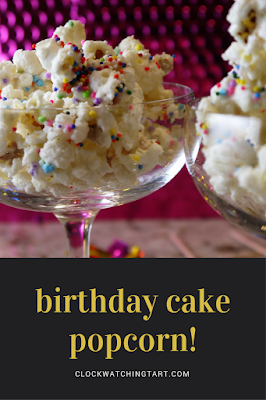 Clockwatching Tart: Birthday Cake Popcorn! 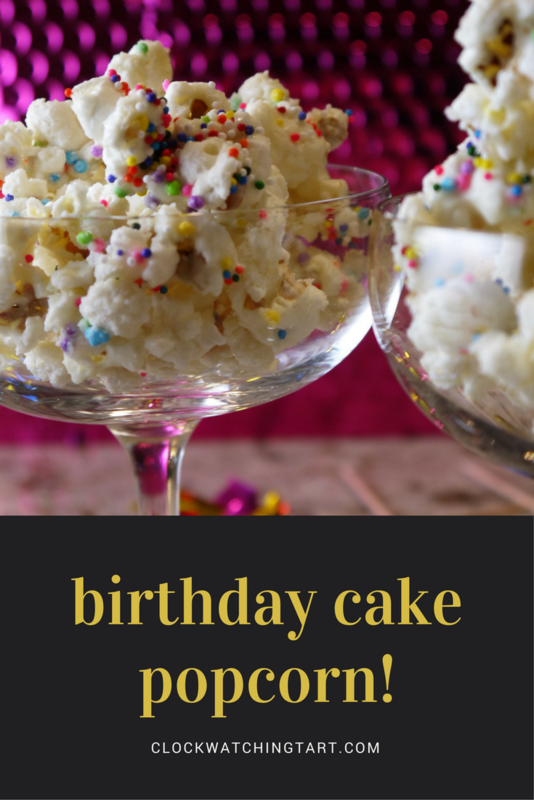 Fresh popcorn coated in white chocolate, cake mix and sprinkles makes an adorable, fun snack! This is a great treat for a kids (or grownups) party, a school snack or just for fun. The ingredients are easy to find in the bulk store or the baking aisle. Pop the popcorn. I use this great microwave popping bowl, or use the stove. Place the popcorn in a very large bowl. Melt the white chocolate in the microwave in 30 second bursts, stirring in between, or melt it in a bowl over a pot of simmering water. Working quickly, mix the cake mix into the melted chocolate. Then pour it over the popcorn, tossing to coat all the popcorn with the chocolate mixture. Sprinkle the popcorn immediately with the nonpariels or sprinkles. Spread the popcorn on a baking sheet to set. Break the pieces apart and serve the popcorn in a bowl or in individual cups. I like the look of these champagne coupes but little plastic cups would be a cute idea for individual servings. Make this cute snack! It's so easy!